Compliments a rustic, industrial or luxurious style home. For a truly unique statement decorative item in your home, a copper wall clock is one to consider. Once used in the olden days, this copper trend is coming back round as it gives home a more luxurious style. The best copper wall clocks should be designed well in function and style to enable it to give a room character. Versatile in matching decor, it’s perfect for anyone who is after a retro, vintage, antique and even industrial look. A copper wall clock can also be the perfect gift for kitchen fanatics or for a copper wedding anniversary present. 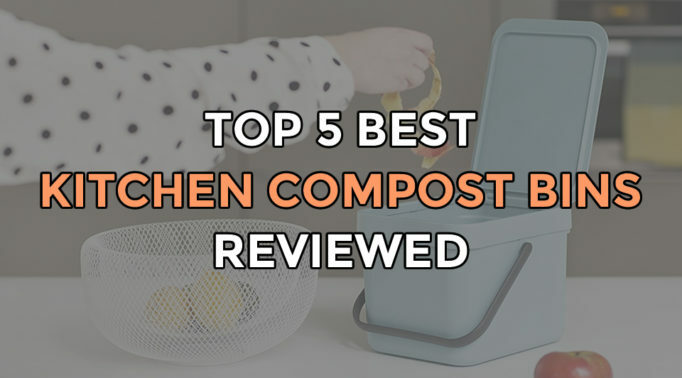 Probably some antique ones are harder to get hold of now but no need to fret as we’ve put together some of the best ones this modern age has to offer. Designed entirely out of copper steel with a brushed finish, the Karlsson KA54770CO has a nice depth to it allowing it to boldly protrude from the wall for maximum exposure. The brushed finish makes the dial free from reflective light and glare so it’s easy to see the time. The bold black steel hands are long so it points accurately to the deep engraved Arabic numerals. There’s a seconds hand which sweeps smoothly around the dial without making a sound. 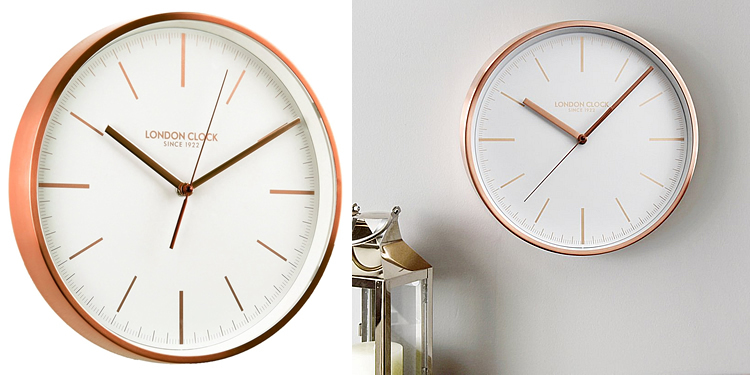 The quality of this copper clock is good and has a great retro look and feel to it. Measuring just 19 cm in diameter, this makes a great copper kitchen wall clock along with its thickness and lovely brass colour. 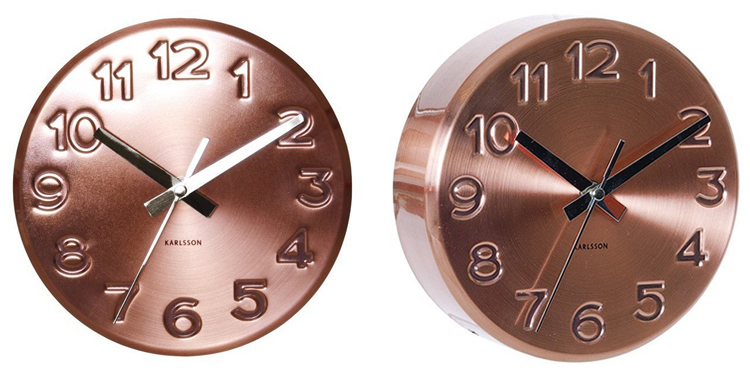 Stylish and fashionable, the Karlsson KA5578WH Maxie copper wall clock is a great way to get in with the copper trend. 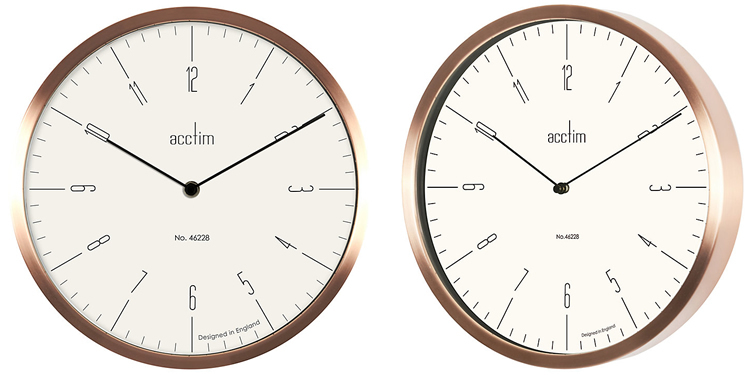 The dial face is designed traditionally with a white background and a modest font for the numbers which are copper. Completing this theme are the copper hands and a copper casing. It’s a nice designer clock at a decent size of 29 cm diameter which will be sure to stand out on your wall. 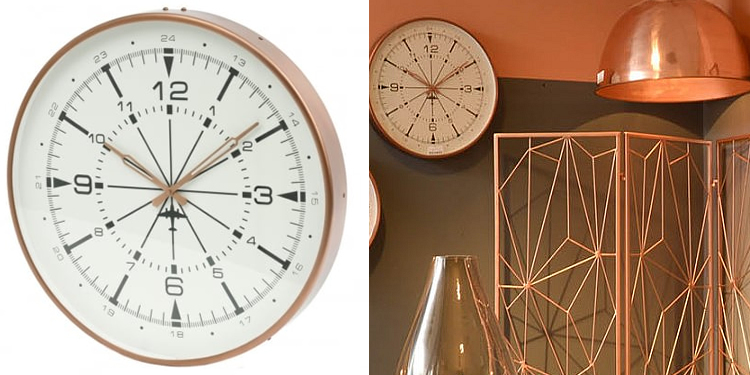 Looking like a compass, the Libra Furniture Copper Aviator wall clock is a truly uniquely designed clock that will be sure to catch the attention of anyone entering the room. Featuring a 24 hour marking system in its dial, you will be able to manage your time throughout the whole day. It has the usual 12 hours round the dial and the later 12 hours are marked in a smaller font on the outer edge. Because of its design, some of the numbers are smaller but this doesn’t make it hard to read since the size of the clock is a whopping 44 cm in diameter. It’s all complete with marked minutes for a more accurate read as well. The antique copper design is limited to the rim and clock hands but this makes it an elegantly designed large copper wall clock that will bring instant glamour to any room. 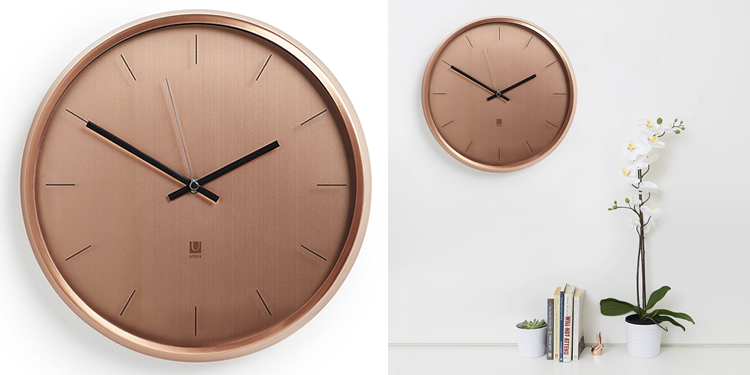 Constructed with solid metal materials, the Umbra Meta Copper Wall Clock has a beautiful rose gold coloured hue that will bring style to a modern or retro home. The details of the dial are simple with just batons in place of numbers, black clock hands and a thin seconds hand which is what makes this design a classic. Instead of ticking around the dial, the seconds hand glides soundlessly around without disturbing the peace. Covered in a crystal clear glass lens, this gives the clock a higher quality finish and makes it easier to read the time. 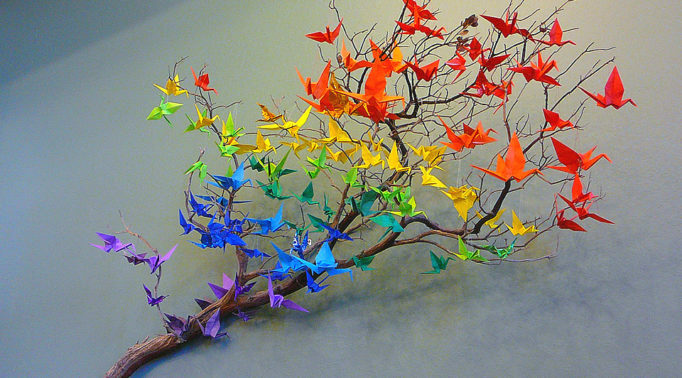 Although it’s a bit pricey, it has a minimalist look to it so it will match any room in the home and has a great quality to boot. 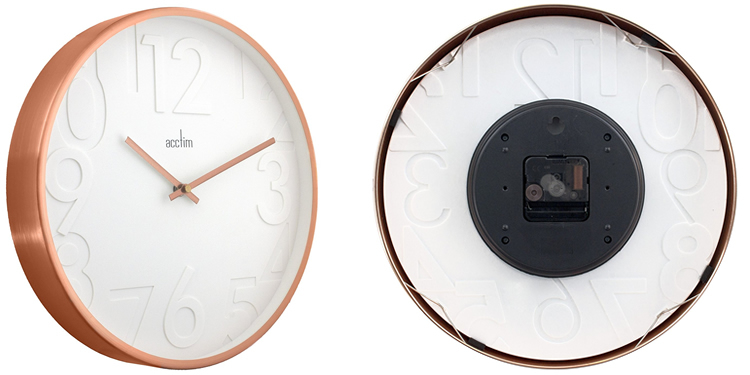 If you want to make a statement in your home or kitchen, the Umbra Ribbon Copper clock is definitely one to consider. Designed as a 12 point star with each point acting as the numbers, this clock is a cry away from the traditional clock designs. It’s made out of copper plated steel which has been bent over each point to make a hollow ribbon (hence the name) which meets with the others in the middle. 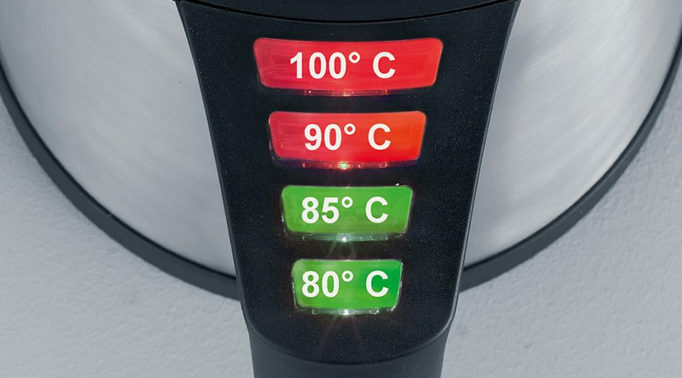 Without a dial face, it’s not as accurate if you’re trying to guess the minute of the hour but it’s not hard to read the time with the points and easy to see black clock hands. This unusual design makes it one of the best copper wall clocks to make a statement in your home. 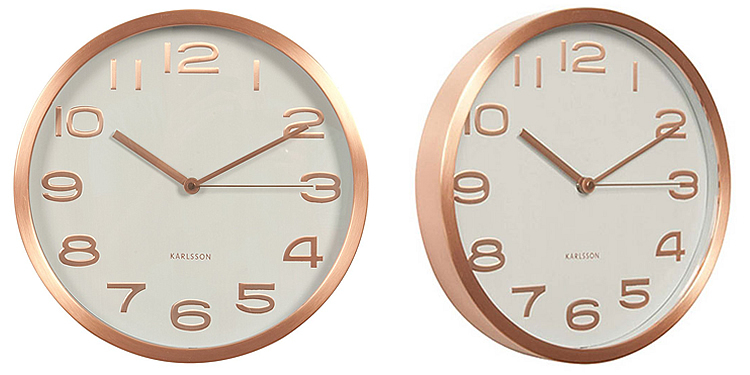 The London Clock Company Brushed Copper Wall Clock is designed in a sleek and luxurious style with function in mind. With a simplistic design of a traditional cream colour dial, the copper marked batons and copper coloured hands are easily visible. 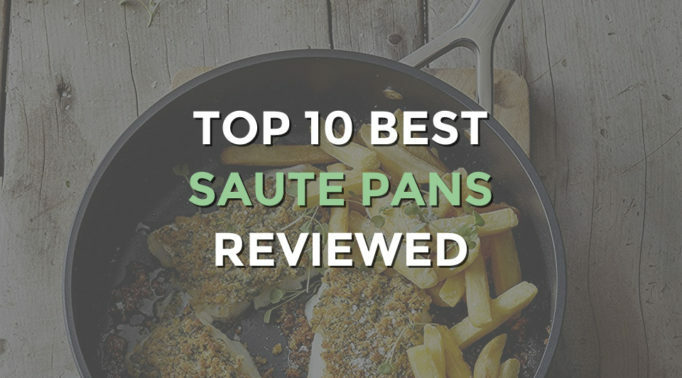 It can even be seen from across the room with its generous size of 30 cm in diameter. This large copper wall clock also has a nice thick depth of 4.5 cm to really show off its lovely brass copper coloured rim. There’s no ticking sound coming from it thanks to silent sweeping seconds hand. 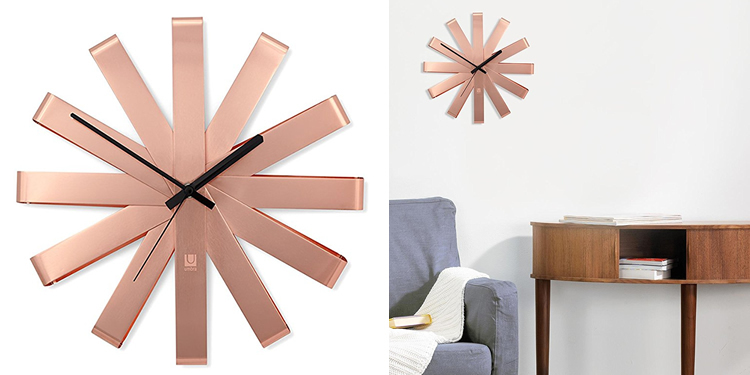 If copper is a theme in your kitchen, then this wall clock will be the perfect complement for it. 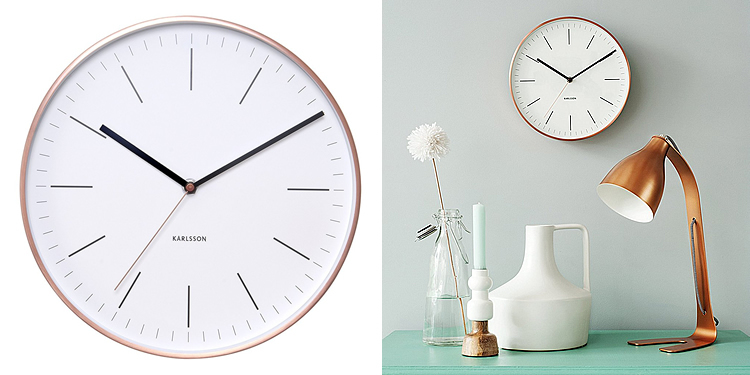 For anyone who is after a very subtle copper wall clock, the Karlsson Minimalist will do the job effectively. Looking at the white dial with black baton markings and clock hands, you’ll probably wonder where the copper is until you look at its case. It’s thin on the rim but can be seen from the side with its generous few centimetre depth. 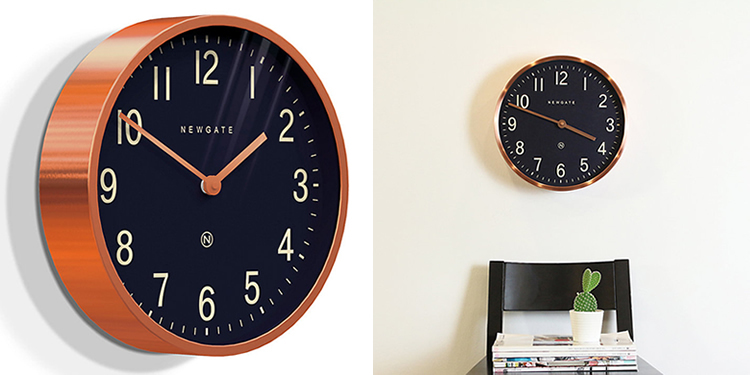 The colour is unlike other copper wall clocks which tend to be in warmer or richer hues. This one is more of a cooler tone and leans towards a white copper colour making it fashionably subtle. It’s a silent and smooth operator too as the seconds hand glides around. With a subtle funky design in the dial, the Acctim Rostock sets out to grab attention without going over the top. The white dial features large moulded Arabic numerals (which is the funky) with copper steel hands and a copper casing to offset it. Although the numbers are also white, it’s easy to read as its moulded depth is quite deep. This gives the clock a contemporary style which will suit any room in the home including the bedroom. Powered by an accurate quartz clock movement, the Acctim Evo is clear to read with its contemporary style black Arabic numeral font and marked minutes and seconds. It’s not too big but enough to read from across the room which gives it an air of sophistication. The font design of the clock is almost similar to those found on kitchen scales making it the perfect copper kitchen wall clock. However, its sleek and elegant look is suitable for any other room too whether it’s the office or lounge. 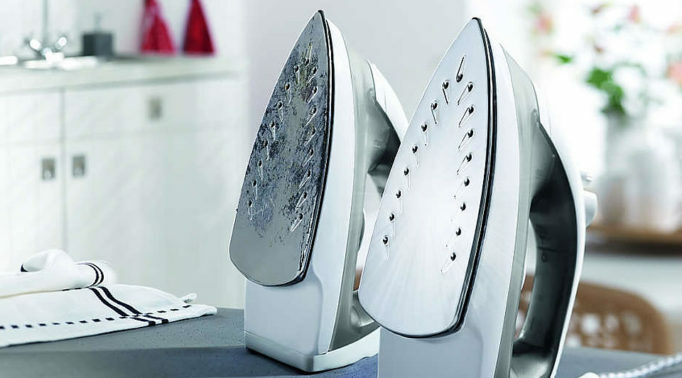 The construction is sturdy and finished to a high quality with materials of metal and glass. The size is big at 30 cm in diameter which isn’t bad for the price it’s going at. Designed to get noticed and make a bold statement, the Newgate Master Edwards is sure to be the first thing anyone sees when they walk into the room. Coloured with a gorgeous midnight blue dial, the cream coloured Arabic numerals and marked minutes and seconds is clear to see. Combined with the rich coloured copper clock hands to contrast it, there’s no excuses for anyone to be late or not be able to see the time. Adding more to this clock’s boldness is a depth of 7 cm so you can really admire the lovely copper case. It’s made to the highest quality with glass and metal materials and the case is straight cut for a clean and graphic line to really show the contrast effect. 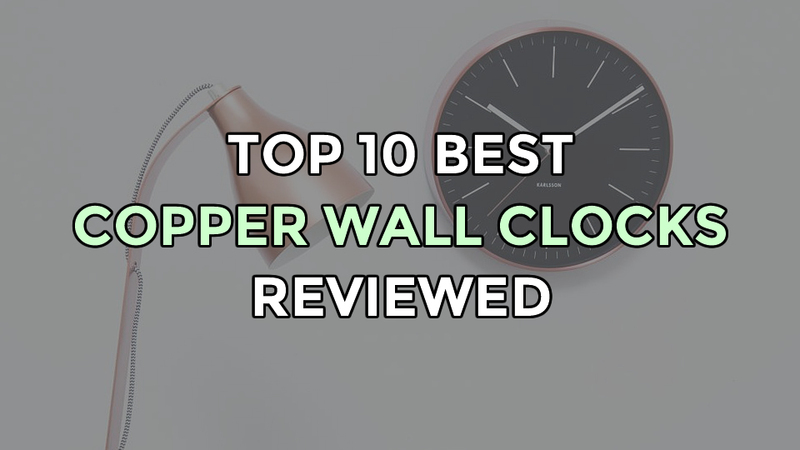 If you’re after a clock that’s bold in statement and to contrast your walls, then this is the best copper wall clock for this purpose.